When will I get my order? : It takes 3-5 business days to process and pack your order. Shipping timing is additional. Words like faith, joy, hope, bliss, honor, forever, are very fitting for many occasions. 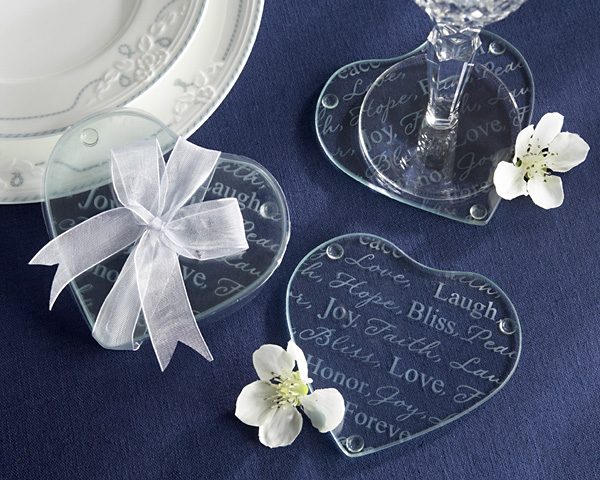 These charming glass heart-shaped coasters carry these words beautifully etched across their top, reminding your guests of the important day. The elegant fonts used for each word convey timeless inspiration. 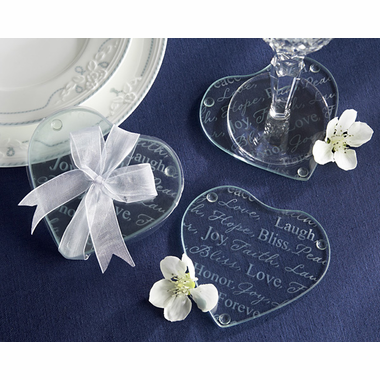 Each favor contains a set of two coasters and arrives packaged with a sheer organza ribbon, which makes a delightful presentation to your guests. Coasters measure 3.5½ by 3.5½.